If you read my newsletters, blog, or books, you know a healthy mouth is a non-acidic, neutral, or alkaline mouth, with a pH 7.0 or above. Tooth roots begin to dissolve as this pH gets a tiny bit below neutral (at pH 6.5) and, when acidity levels dip to pH 5.5 or lower teeth will erode, become discolored, and be at risk for cavities. All acidity weakens teeth, but it is the amount of time that acids are in contact with teeth that determines the severity of the damage. Erosion and decay are worse when people sip drinks or nibble acidic foods. For healthy teeth, exposure to acidity must be kept to a minimum. 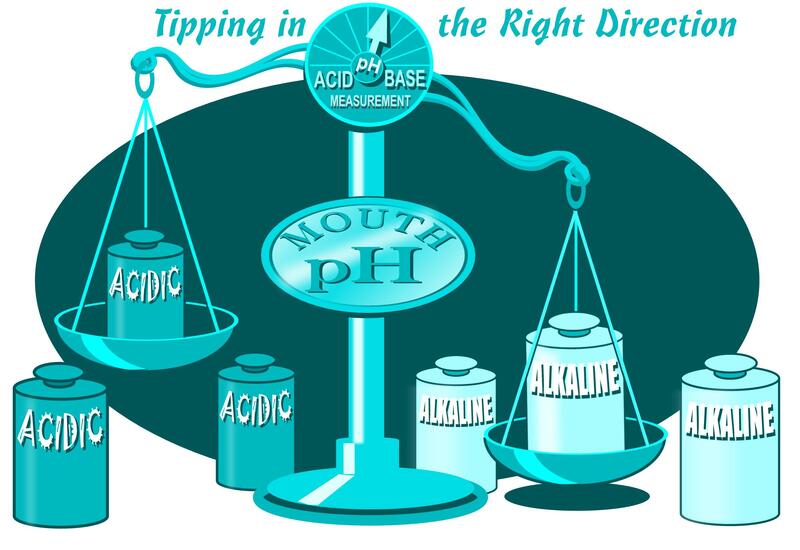 Teeth actually become stronger and re-mineralize when the mouth is alkaline at a pH 7.5 or above. People with acidic saliva often experience dental problems because their own saliva damages teeth. These folks wonder why they have uncontrollable cavities, broken fillings, gum recession or sensitivity, despite their efforts to brush and floss. The solution is to protect teeth with xylitol, and find ways to alkalize the mouth as often as possible. Zellies 100% Xylitol Mints and Gum are an immediate solution for mouth acidity, changing the mouth pH quickly into a safe zone. How long does xylitol protect teeth from acidity? The answer depends on the pH of your “natural” saliva. Saliva filters into the mouth, derived from body liquids, which reflect the pH and chemistry of your body. The effects of stress, hormone changes, sleep deprivation, and poor nutrition makes saliva acidic. As acidic saliva flows into the mouth it will negate the alkalizing benefit of xylitol. People with acidic saliva may need an individualized xylitol regimen to protect their teeth adequately. If your salvia is naturally alkaline, one or two Zellies mints after eating or drinking will usually be sufficient to protect teeth from food or drink acidity. All the food we eat and the drinks we drink change mouth pH. Mouth pH can fluctuate wildly, from the strong acidity of citrus fruits, juices, and wines (pH 2.2 or lower) to the alkaline pH of chicken soup and salty nuts (pH 8.5 or higher). Pure xylitol (like Zellies Mints, Zellies Gum and Zellies Bears) prevent cavities by helping turn an acidic mouth into an alkaline mouth, in minutes. The best time to benefit from xylitol is to eat one or two mints, a ZellieBear, or xylitol gum at the end of every meal, drink or snack. The pH of fluids circulating around the human body (including the saliva in your mouth) register in a narrow pH range. The pH of blood should be approximately pH 7.3 (slightly alkaline) while healthy saliva should register 7.0 (neutral). When the pH of body fluids is alkaline and above 7.0 it indicates an oxygen-rich environment (which is an ideal state for good health). When pH levels are below 7.0 (acidic) this indicates an oxygen-deprived environment, which primes our body for disease and our teeth for de-mineraliztion and cavities. Xylitol helps defend teeth by alkalizing the mouth. However, for total health, it is important to work to alkalize your body. Doing this, will not only benefit your health but it will help to alkalize saliva for additional mouth and tooth protection. There are times in life when, no matter what you do, saliva seems to become acidic. The hormones of pregnancy appear to change saliva and put women’s teeth at risk for acidic damage. Stress and sickness also create times of mouth acidity. Other variations occur like a rhythm, with daily fluctuations in pH and flow rate (diurnal variation). Saliva is least protective at night and in the early hours and most alkaline and protective in the afternoon. You can achieve improvement in saliva pH by making lifestyle and habit adjustments (reduce stress, exercise, sleep etc), and you can also influence saliva pH by selecting specific foods to eat, foods to help “alkalize” the body. As we digest foods, their by-products or nutrients are absorbed into our body. Not all food provides good nutrients, and some create acidic by-products that work against us. Most experts agree we need at least 80% of our daily foods to be the kind that help us maintain a neutral or alkaline body pH. If you eat alkalizing veggies and fruits, your body will not fully benefit from them without the correct enzymes to mange the absorption of their nutrients into the body. Some fermented and raw foods provide enzymes, but these may not be adequate. If you have a good diet, I often recommend additional raw probiotics (pill form) pineapple (bromelain), and papaya (papain) – perhaps a little at each meal – to ensure maximum nutrition for your body and mouth. a) Lemons are one of the best products to alkalize your body, but they have such a low pH in the mouth, drinking lemonade can destroy teeth. b) Spinach is good to alkalize the body, but the oxalic acid in spinach can destroy the healthy pellicle on teeth and make them sensitive. If you eat lemons or spinach –be sure to incorporate them into meals and end the meal with some Zellies Xylitol. Fortunately many alkalizing foods are not damaging to teeth: foods like watermelon, asparagus, mushrooms, mango, apples, and garlic. Many popular soft drinks create body acidity and feed acid-producing bacteria in the mouth, promoting gum disease and cavities. These drinks contain acids plus lots of sugar and/or high fructose corn syrup. The worst may be carbonated soft drinks– especially if they contain additional caffeine. People with gum disease often have a kind of bacteria in their mouth that affects their taste buds, making water unpalatable. If you dislike water, and have bad gums, try adding one teaspoons of xylitol into water and sip this, in place of soda, for a week. You may find your taste buds recover and your desire for soda is reduced. Limiting or eliminating soda will be good for your gums, teeth and body health!